People find their way to Toastmasters for many reasons. For some it’s a need for better business presentation skills. For some it’s that looming special occasion speech. For some it’s facing a fear; a fear that holds back so many people from what they want to achieve in life. For me, it was a curiosity …. about the building where my local club met. I went to my first meeting and the building was indeed fascinating, but as I sat there, I could feel an anxiety bubble up in me about public speaking. As I rose to my feet to introduce myself to the club, I felt my mouth go dry, my heart race and the words stumble out. Inside, there was a voice inside telling me “You can’t do this!”. Fortunately, that voice wasn’t the only one I heard that day; the club President uttered two words that forever changed me: “Take Courage”. I came back to the next meeting. And found, what you find at every Toastmasters club, a bright, friendly community of people that want to see you conquer your fears and see you do well. That community doesn’t just stop at the club – it spreads! Division B is a community of some 30+ clubs around London each one unique. They range from community clubs, to corporate clubs, language clubs to specialist debate clubs. No matter what your interest, you’re bound to find a local group and a perfect fit for you. Each club follows the same basic programme of prepared speeches, thoughtful speech evaluations and impromptu Table Topics, with each club having their own twist on proceedings. 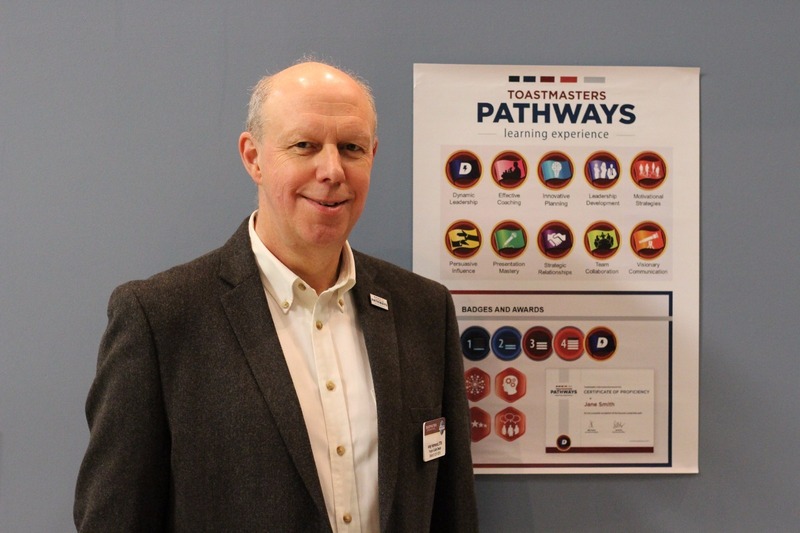 As well as the speaking there are plentiful leadership training opportunities ranging from the roles performed at the meetings through to the club officers running and growing each club. Four years after I joined, I’m still finding new things to learn at every meeting and am constantly surprised by what I learn at Toastmasters impacts the rest of my life. Public speaking is now a thrill. The anxiety is still there, but I channel the nerves into my time on stage. I hope by joining us, you too can find what you’re way to better public speaking and leadership skills.